The Census also lists the Cincinnati–Wilmington–Maysville, OH–KY–IN Combined Statistical Area, which adds Clinton County, Ohio (defined as the Wilmington, OH micropolitan area) and Mason County, Kentucky (defined as the Maysville, KY micropolitan area) for a 2014 estimated population of 2,208,450. 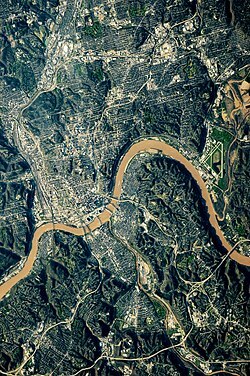 The Cincinnati metropolitan area is considered part of the Great Lakes Megalopolis. The Cincinnati, OH–KY–IN, MSA was originally formed by the United States Census Bureau in 1950 and consisted of the Kentucky counties of Campbell and Kenton and the Ohio county of Hamilton. As surrounding counties saw an increase in their population densities and the number of their residents employed within Hamilton County, they met Census criteria to be added to the MSA. The Hamilton–Middletown, OH MSA was also formed in 1950 and consisted solely of Butler County, Ohio. In 1990, the Census changed designation of the areas known as MSAs to Primary Metropolitan Statistical Area (PMSA), and a new Consolidated Metropolitan Statistical Area (CMSA) grouping was created. From 1990 through 2005, the Cincinnati–Hamilton–Middletown CMSA included the Cincinnati–Hamilton, OH–KY–IN PMSA and the Hamilton–Middletown, OH PMSA. As of December 2005, Census terminology changed again, eliminating the PMSA/CMSA terminology. Consolidated Statistical Areas (CSA) combine more than one Core Based Statistical Area (CBSA). Newly defined MSAs (Metropolitan) and µSAs (Micropolitan) Statistical Areas are CBSAs. From 2005 to 2013, the Cincinnati–Middletown–Wilmington CSA included the Cincinnati–Middletown MSA (defined as the old Cincinnati–Hamilton–Middletown CMSA), and Wilmington, OH µSA (Clinton County, Ohio). In 2013, the CSA was redefined again. The Cincinnati–Middletown MSA was renamed the Cincinnati MSA. The Wilmington, OH µSA remained in the CSA. The Maysville, KY µSA, which had previously consisted of Mason and Lewis Counties in Kentucky, was redefined as consisting solely of Mason County and added to the CSA. The name of the CSA accordingly changed to the Cincinnati–Wilmington–Maysville CSA. A map of Greater Cincinnati's freeways. The metropolitan area's population has grown 8.1 percent between Census 2000 and the 2009 Census population estimate, just under the national population growth rate of 9.2 percent over the same period. This growth rate is about in the middle of the growth rates of other similarly sized mid western metropolitan areas. For example, the Cleveland metropolitan area lost approximately 2% of population, while Louisville gained 8%, Columbus gained 12%, and Indianapolis gained 14% over the same time period. The 2009 population estimate from the US Census classifies population changes between natural population increases (number of births minus number of deaths) and net migration (the difference between people moving into the region minus those moving out of the region). Natural population increase contributes fundamentally all of Greater Cincinnati's population growth. A small amount of net international migration to the region is offset by a small amount of net domestic migration out of the region. The Cincinnati Metropolitan Statistical Area (MSA), which includes seven counties in Northern Kentucky and three in Southeast Indiana, is the largest metropolitan area that includes parts of Ohio, exceeding the population of Greater Cleveland, though both Greater Cleveland and metropolitan Columbus have larger populations within the state of Ohio as of 2013. Most of the region's population growth has occurred in the northern counties, leading to speculation that the Cincinnati-Northern Kentucky metropolitan area will eventually merge with Greater Dayton. Cincinnati is also located very close to other metropolitan areas, such as Louisville, Lexington, and Frankfort, Kentucky, and Columbus, Ohio. 1For comparison purposes, population data is summarized using 2008 Census CSA/MSA county definitions. 2Butler County, Ohio was previously known as the Hamilton–Middletown, OH PMSA and was separate from the Cincinnati, OH–KY–IN PMSA until the 1990 Census, when the Cincinnati–Hamilton, OH–KY–IN CMSA designation was used to consolidate the two PMSAs. The CMSA/PMSA designation is no longer used by the US Census. The Cincinnati–Northern Kentucky metropolitan area is located within a climatic transition zone. The southern area of the region, from roughly about the Ohio River, is at the extreme northern limit of the humid subtropical climate; the north part of the region is on the extreme southern cusp of the humid continental climate. Evidence of both humid subtropical climate and humid continental climate can be found here, particularly noticeable by the presence of plants indicative of each climatic region. Within the area, the USDA climate zone rating can vary from as warm as zone 6b to as cool as zone 5b, with the warmest areas tending to be found closest to the Ohio River; individual microclimates of even cooler and warmer temperature may occur in the area but are too small to be considered in the overall climate zone rating. The common wall lizard, introduced from Italy in the 1950s, is an example of fauna in the area that lends a subtropical ambiance to the urban core (near downtown Cincinnati) area of the region. Suburban: large parking lots that take up much land in Mason, West Chester, and Florence create a heat island effect. North: Great Miami River, the area is situated on a glaciated flat plateau, the Miami Valley, and some urban heat island effect in the immediate area of downtown Dayton and Hamilton. Traveling through the region from North to South, a subtle but interesting change in climate can be observed and is most evidenced by the gradual increase in the occurrence of subtropical indicator plants in the landscape. Most noticeable are the Southern Magnolia and Mimosa trees, and the needle palm also may be found as a winter hardy landscape specimen in lawns near the Ohio River. During the winter, travellers from north to south will routinely observe a significant difference in snowfall/ice/rain in the region. Although widely accepted as part of the Midwest, the Cincinnati–Northern Kentucky metropolitan area is climatically and geographically located on the northern periphery of the Upland South region of the United States and is within the Bluegrass region of Ohio and Kentucky. The area is vulnerable to occasional severe weather—thunderstorms, large hail and sometimes tornadoes. Cincinnati-based broadcast media outlets often use the terms "Cincinnati metropolitan area" and "Tri-State Area" to refer to their broader viewing or listening areas, especially for the purpose of weather reports or school closings. The viewing areas of WLWT, WCPO-TV, and WKRC-TV all span the same 26 counties, including Adams and Highland counties in Ohio; Fayette, Ripley, Switzerland, and Union counties in Indiana; and Carroll, Owen, and Robertson counties in Kentucky. WXIX-TV additionally includes Decatur County in Indiana and Lewis County in Kentucky. Dayton-area media outlets similarly refer to a Miami Valley area that includes Butler and Warren counties in Ohio and sometimes Clinton County, Ohio, and Union County, Indiana. ^ "Ready for 'Daytonnati?' It could happen". Cincinnati.bizjournals.com. 1998-11-09. Retrieved 2012-05-14. ^ Ramon Jordan (2012-01-24). "National Arboretum – USDA Plant Hardiness Zone Map". Usna.usda.gov. Retrieved 2016-05-25. ^ "NowData—NOAA Online Weather Data". National Oceanic and Atmospheric Administration. Retrieved 2018-02-21. ^ "Station Name: KY CINCINNATI NORTHERN KY AP". National Oceanic and Atmospheric Administration. Retrieved 2014-03-30. ^ "Records for Cincinnati". National Weather Service. Retrieved 2012-04-13. ^ Rogers, Allison (January 12, 2019). "Winter weather update: Snow mixing with rain for some". WLWT. Hearst Television. Retrieved April 17, 2019. ^ "Maps". WCPO-TV. E. W. Scripps Company. Retrieved April 17, 2019. ^ "Cincinnati Maps". WKRC-TV. Sinclair Broadcast Group. Retrieved April 17, 2019. ^ "Weather". WXIX-TV. Gray Television.